Martha Melinda Kerns was the dauther of John Kern and Julia Brickey. 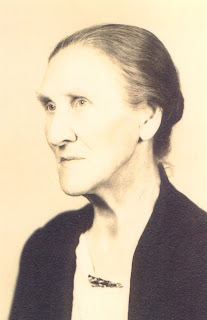 She was born 04 Oct 1877 in Scott Co., VA, and died 25 May 1973 in Kingsport, Sullivan Co., TN. She married (1) John Floyd Brickey 15 Aug 1892 in Scott Co., VA, son of James Brickey and Matilda Sloan. He was born 12 Sep 1870 in Scott Co., VA, and died 20 Jun 1919 in Scott Co., VA. She married (2) Noah T. Hobbs Abt. 1920. Noah T. Hobbs is buried in Herman Cemetery. She is buried in Oak Hill Cmetery Kingsport, Sullivan Co., TN.